I didn't prepare any bento for the kids today as they had lunch from their school catering. So I just took some pictures showing one of my bento tools ; a set of 3 decorative knife, stainless steel. These tools are very fancy, come in 3 different colors and a cover for each tool. Size of the pen makes it easy to hold. *) Yellow Tool >> 2 sizes hole maker, 7mm and 5mm. *) Green Tool >> U and V shapes knife. 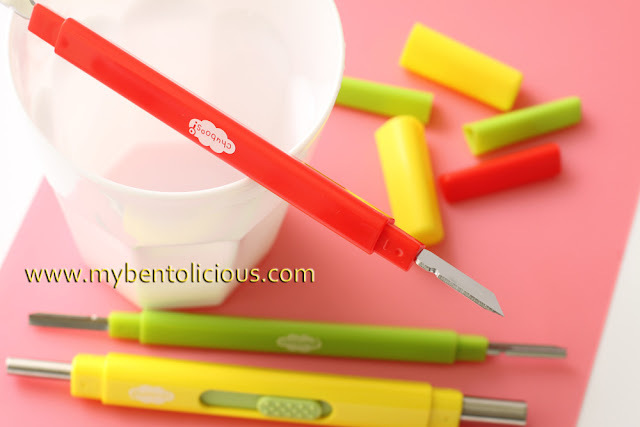 *) Red Tool >> Sharp knife and melon baller. This time I will just be focusing on the Yellow Tool and will do some tips on the other 2 tools later. 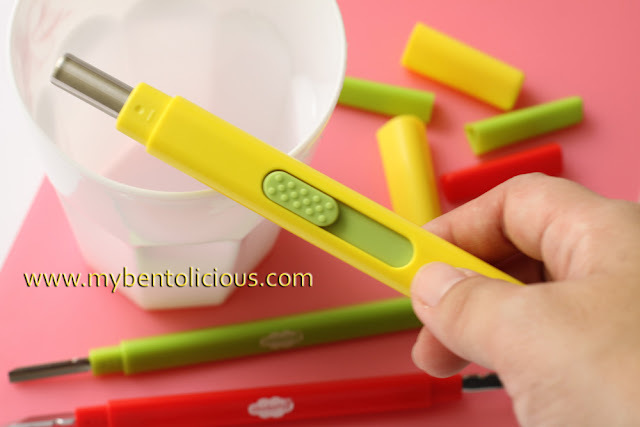 As this yellow tool is fancy to have it but you can replace it with straws to make eyes, cheeks and others. 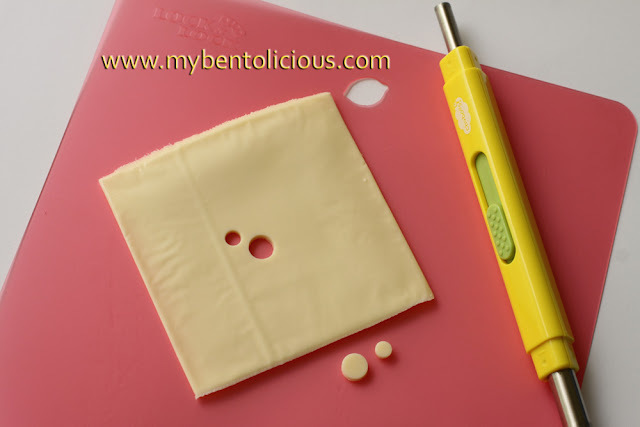 I am using cheese to show you that medium and big straws can replace the yellow tool. You can see that medium and big straws are exactly same diameter size with the yellow tools. Yellow tool has some advantages like can cut something hard and is easy to release because it has the switch button as shown below. While for the straw, the release will be using the toothpick. 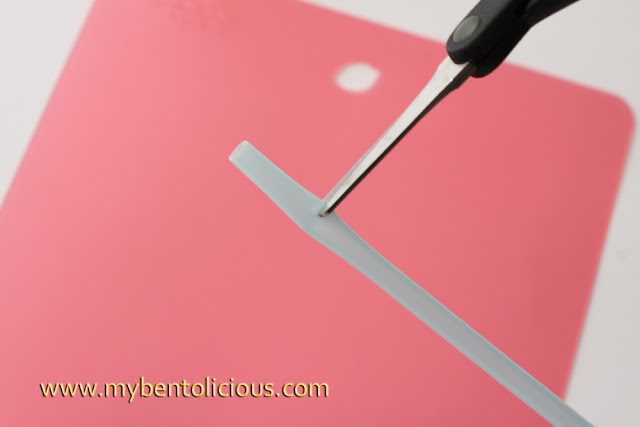 As shown on the pictures below, just cut the straw about 2cm. 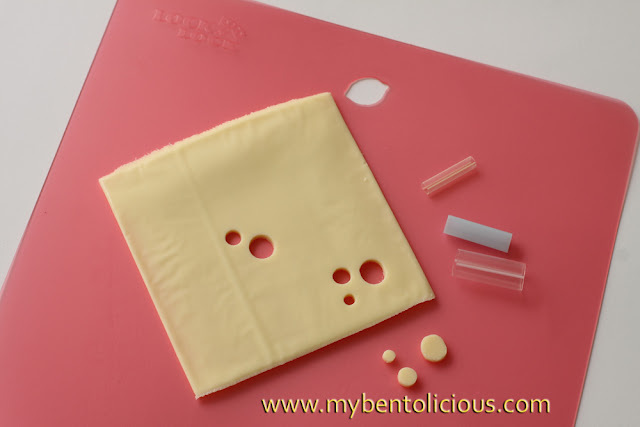 After punch it to the cheese for example, the cheese will stick inside the straw. Therefore you can use toothpick to push the cheese out from the straw (use the unsharp edge of the toothpick). But to punch something soft like cheese, ham, half cooked carrot, crab stick, kamaboko, etc. 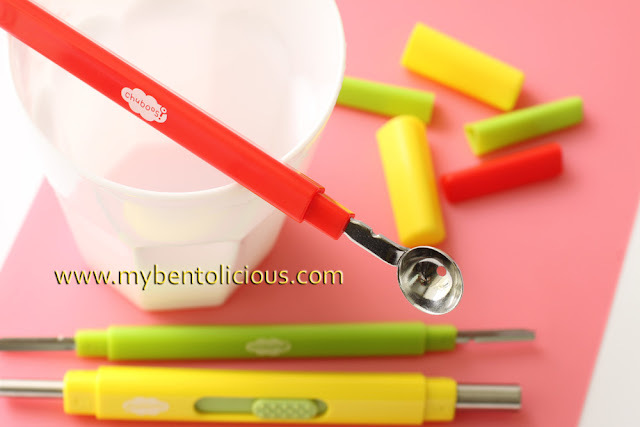 ... the straw also have an advantage because we can have small diameter size that is not available on yellow tool. 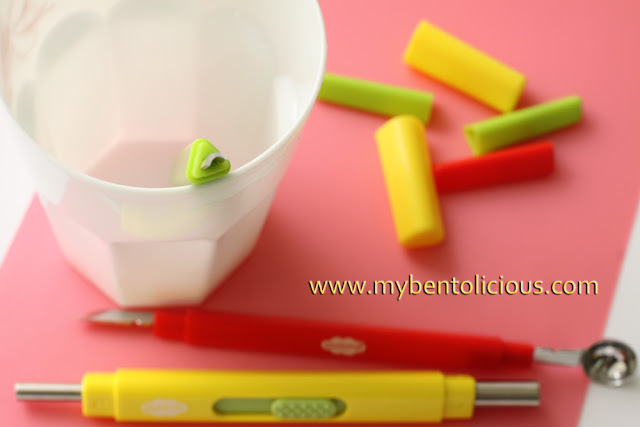 Hope these tips can be useful and you can have more great ideas to have fun with your bento! Thx alot for the idea with the straws! @Token : Thanks Token! I asked my friend to send it from Japan last year. Maybe you can check it on e-bay? Thanks for sharing the tips! I feel like attending a new lesson when every time I come here. @Jenn : Thanks Jenn! My friend sent it to me, perhaps you can check on e-bay. @Rachel Hei : Thanks Rachel! oh my! cc.. this is helps me a lott :) i just couldnt imagine how the tools looks like :) Thankyouu soo much for sharing this. 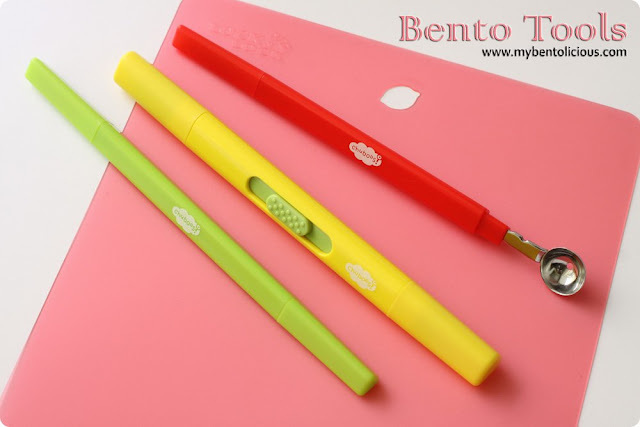 just found your blog from bento central. so so cute. i'd never heard of those tools before. thanks for the tip. Great tools Lia Chen. 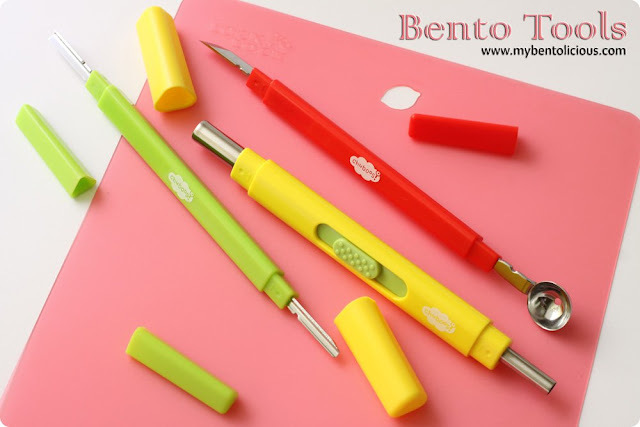 I didn't know there is such bento tools in the market. Thanks for sharing. You find the cutest things Lia! I love to see your tutorials and amazing bento stash all at the same time! You make great use of your blog, I love it!! Neato! This reminds me. I was in New York City this past weekend. I wandered into a kitchen store, and inquired about vegetable cutters (like you've mentioned in the past). But they didn't have anything! Thanks for sharing your bento tips and tricks Lia. @Rachel Yukiko Perez : Thanks Rachel! I *might* spring for a set!